E-flocx is an accelerated electrocoagulation system which destabilises dissolved, colloidal , emulsified and other stable compounds in water and converts them into suspended particles. These suspended particles get removed on filtration and result in completely colourless, odourless and reusable water. Eflocx has proven to be a very versatile process able to handle large variety of wastewaters of different volumes. The process works on the principle of controlled dissolution of charged ions in water. These charged ions on contacting various pollutants like suspended solids, bacteria, organics, heavy metals etc. neutralize them and coagulate them. These coagulated solids are subsequently filtered using suitable filtration equipment. There are significant savings on labour, chemical cost and electrical power. As the process is not based on moving parts there is low maintenance except routine replacement of electrodes. The systems are modular in nature hence expansion and modification is easily possible. The system is portable in nature and thus can be shifted and transported in case the industry is being relocated. The operating cost of system is in the range of Rs. 5 to Rs. 15 per kilo liter (1000 litres) depending on the wastewater characteristics. Low space compared to conventional systems and less holding capacity required due to continuous treatment Floor space required is significantly higher as holding capacity of tanks needs to be high due to batch treatment. Significant saving on civil work cost as civil work construction is minimal compared to conventional systems. Civil work construction is very extensive due to construction of holding tanks, settling tanks, aeration tanks, secondary clarifiers, sludge drying beds etc. 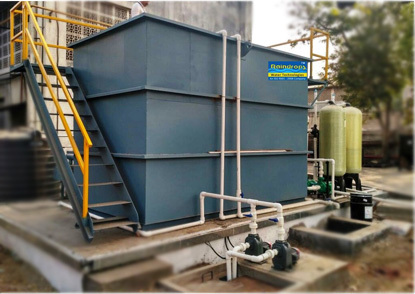 Can easily handle shock loads of effluents by changing current density or flow rate Shock loads of effluents will not be handled by conventional systems. Modular in nature. Very convenient to scale up capacity with additional units. Not modular in nature. Once installed, scaling up capacity is not possible.